A total of 54.09 percent polling has been recorded till 2 p.m. in Himachal Pradesh Assembly election. Earlier, till 12 noon, 28.6 percent polling was recorded in the election to the hill state. Amongst the Bharatiya Janata Party (BJP) leaders, party's chief ministerial candidate Prem Kumar Dhumal, MP Anurag Thakur and Union Minister JP Nadda have cast their votes besides Congress leaders like Anand Sharma, Sukhvinder Singh and others. 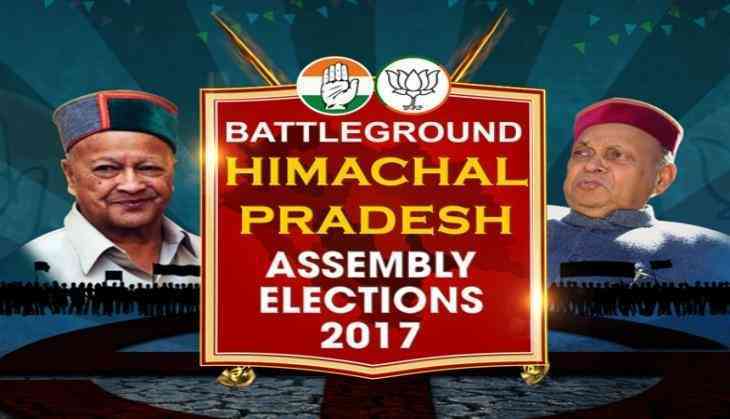 Voting is being conducted in 68 assembly constituencies of Himachal Pradesh in single phase to choose the next chief minister of the state. A total of 337 candidates, including 19 women, are in the fray to sweep the polls in the hilly state. As many as 50, 25,941 voters are eligible to cast their votes and 37,605 polling personnel have been deployed at 7,525 polling booths. 983 polling stations had been declared vulnerable and 399 as critical to ensure free and fair elections in the state. Congress leader and six-time Himachal Pradesh Chief Minister Virbhadra Singh is fighting against Dhumal, to be the next head of the state. The counting of votes will take place on 18 December.